In this political netnography study, my goal was to map clusters of conversation about Donald Trump on Twitter. I randomly selected subsets tweets from a database of ~20,000 tweets collected with the Twitter API by searching for “Donald Trump” over the past week. I vectorized these tweets and calculated the cosine similarity between them. Using the Python networkx module, I created edges between all nodes with cosine similarity >=0.65. All terms containing the words “Muslim” and/or “Islam” are colored red. 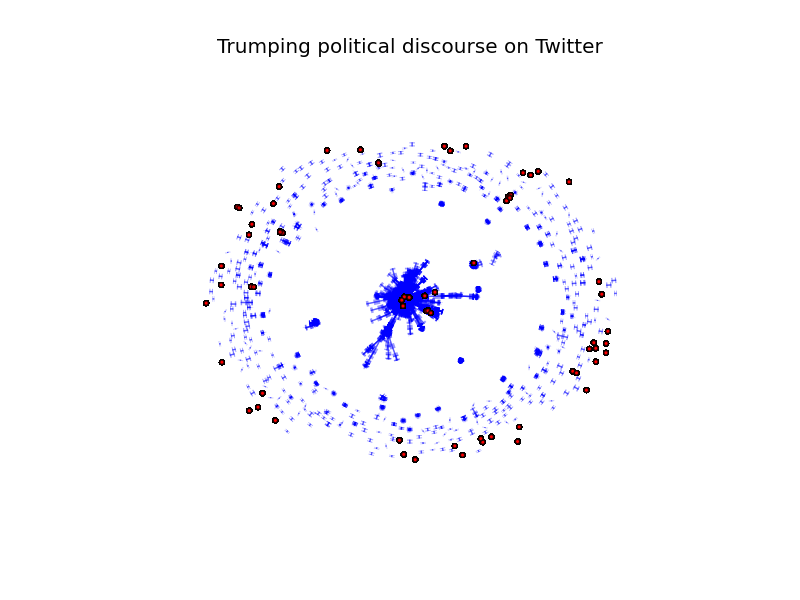 The result is a lexical topography of Twitter discourse about GOP candidate Donald Trump. This method nicely clusters lexically related tweets: notice the tentacular pattern emerging from the center of the figure and the smaller clusters closer to the periphery. The closer to the center of the graph, the higher the centrality of the tweets (the more connected they are to other tweets). Interestingly, there is a lot of red in the central part of figure, corresponding to tweets with high centrality and lexical power about Muslims and Islam. As the saying goes, it doesn’t matter what they’re saying about you, as long as they’re talking about you. Provocative, Islamophobic comments seem to be kindling wood feeding the fire of Mr. Trump’s political campaign, winning him the attention he needs on social media.